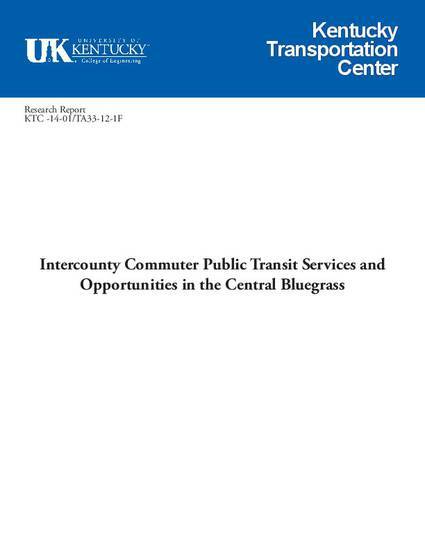 This report reviews the current state of available public transportation services in central Kentucky, with a focus on the Lexington-Fayette County commutershed. Within the region, this report identifies the major public transportation providers, describes the transit services available through them, and examines the potential opportunities of intercounty commuter public transportation services. Using intercounty commuting data obtained from the 2006-2008 Census Transportation Planning Products (CTPP), this report estimates the potential need and opportunity for additional transit services. Lastly, this report argues for the viability of vanpools as an efficient and cost-effective strategy for addressing the shortage of intercounty commuter transit services. The contents of this report reflect the views of the authors, who are responsible for the facts and accuracy of the data presented herein. The contents do not necessarily reflect the official views or the policies of the University of Kentucky, the Kentucky Transportation Center, nor the Federal Highway Administration. This report does not constitute a standard, specification, or regulation. © 2014 University of Kentucky, Kentucky Transportation Center, Information may not be used, reproduced, or republished without our written consent.